In both numismatics and general business, 1978 continued in lockstep with 1977. More collectors seemed to enter the field, as more reference books and coin boards were being sold. 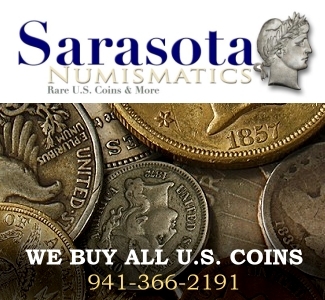 The American Numismatic Association grew in numbers. Major collections were to be offered in auction. If more proof were needed that more people were becoming collectors, in 1978 the United States Mint issued well over three million Proof Sets. These were sold by the Mint at a premium because of the special striking and protective packaging. In addition to the above, the price of silver started to increase as the famous Hunt Family of Texas, who made a fortune in oil, decided to corner the market. Massive amounts of silver coins, bars, and fixtures from one’s home were sold and made into ingots. As early as 1973, Bunker Hunt bought some 35 million ounces of silver and had it shipped to vaults in Switzerland, with other Hunt family members doing something similar. Silver was rising in value each year, and the Hunt Family bought as much as they could. They also went into the markets and placed and bought margin calls to further enhance their holdings. United States silver coins became more valuable as the premium for silver more and more exceeded the face value of each dime, quarter and half dollar struck before 1964. Coin shops nationwide became depots for those who were selling their silver coins at premiums far above face value. Market pressure from the surge in silver prices took gold along for the ride, which was not as actively traded but still gathered premiums. Naturally, the growth in the value of precious metals had a direct effect on the price of numismatic coins. Stack’s tried to stay away from trading in this precious metal market. 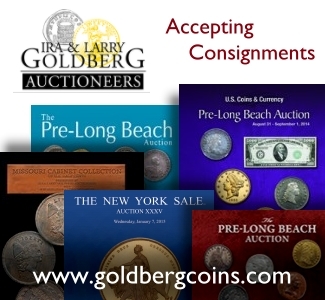 We were so busy trying to serve our coin collecting clients that we referred many a holding to neighboring dealers in New York. Speculation by the Hunt Family was a major force that drove the precious metals markets higher, and ultimately these same prices made it harder for the Hunt Family to sustain their corner. But for a while they did. The ANA Headquarters got more and more active, and many numismatists started visiting the site. It was the fee that we paid to the ANA for the right to run the public auction in conjunction with the 1976 ANA convention (originally $50,000, which grew into $60,000 – in 1978 dollars! ), that funded the new library wing in Colorado. When the Grand Opening occurred in February of 1978, my partner and cousin, Ben Stack (who had negotiated the 1976 auction fee), was present, as both Norman and I developed severe Flu and the doctors did not want us to fly. It really was a “Grand” Opening. Grover Criswell, President of the ANA, Ed Rochette, Executive Director, and many of the staff and members attended. Both the Directors of the Philadelphia and Denver Mints, along with members of their staffs, honored the event by attending. The addition to the Headquarters building, designed to house part of the Library and have study material on display for students and collectors, as well as additional space for staff, had a plaque on the wall that stated: “Dedicated to the memory of JOSEPH B. STACK & MORTON M. STACK, who through their lifetimes dedicated themselves to Numismatics and the American Numismatic Association”. It was their sons and nephews who wanted the efforts of the Stack Family honored! 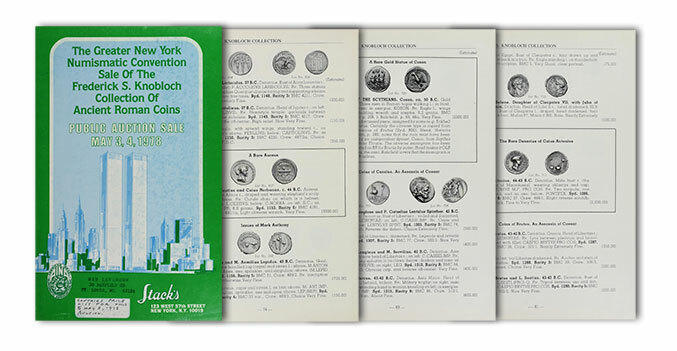 In 1978 we conducted nine different public auctions (and several mail bid only sales through our associate firm, Coin Galleries). The number of lots we offered for sale grew compared to those we sold in earlier years. Each was a great sale in its own right, as they all offered a variety of material. I list below each sale. In February, we offered an old-timer’s collection, the Goshen Collection of U.S. and Foreign Gold, Silver and Copper Coins. 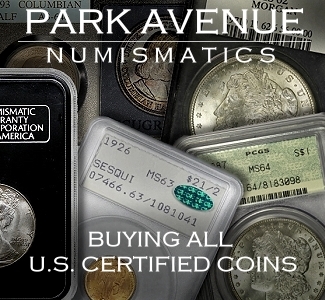 Consisting of some 1,620 lots, it was highlighted by 1857, 1858 and 1873 Proof coins, plus numerous other rare and choice U.S. Coins. The Foreign portion of the sale had a wonderful type offering of choice rare foreign coins of the 20th century. In March, we had the Fraser Collection of U.S. Gold, Silver and Copper Coins–1,120 LOTS–which was a comprehensive offering in each series. Our Spring Sale of 930 lots sold in April, and was also a general and comprehensive offering of U.S. Coins that attracted many buyers. Stack’s highlighted the May Greater New York Numismatic Convention with two auction sale catalogs. The first offering was the fabulous Frederick S. Knobloch Collection of Ancient Roman Coins, 766 lots, which to that point in time was one of the most extensive collections of Roman coinage offered at public action in decades, and the catalog became a reference text for collectors of Ancient Rome. Fred, though he had other avocations, spent many years working and cataloging collections that were consigned to Stack’s, and he was one of my best teachers for the series. Collectors from all around the world attended this important offering. Also at the New York Convention, we had an outstanding and comprehensive offering of U.S. Gold, Silver and Copper Coins (941 lots) that brought a record crowd to the convention. This was one of the most attended New York shows that was attractive to all types of collectors. In June, we were honored to offer the renowned Lighthouse Collection, some 1,021 Lots, which featured some of the choicest and rarest coins to be offered in decades. The owner, who enjoyed attending Stack’s sales for several decades, felt that she could best use the money as a special donation to a wonderful charity that she supported yearly: The Lighthouse, dedicated to helping the blind. Every dollar realized was given to the cause. Highlights of this collection included an extensive offering of Pioneer and Territorial Gold that rivaled several of the series we had offered for sale over the years (such as George Walton, Amon Carter, Dr. Bolt, to mention a few), and had eight $50.00 gold pieces plus many of the California, Utah and Colorado gold coins… plus a wonderful quality collection of $1.00 to $20.00 gold, with proofs and choice Mint State examples. The collection had a goodly number of coins we had sold over the generations, with the buyer sitting in the front row of our sales. It was an honor to serve our special client and the charity she supported. In September of 1978, we offered our Autumn Sale of 1,004 Lots. It featured a general collection of U.S. Gold, Silver and Copper Coins, with a wide selection of choice Mint State and Proof examples, plus a lovely group of Type coins. In October, we offered the Charles Collection: 1,304 lots of choice and rare United States Type coins, intact early proof sets, most minor coins complete in Mint State and Proof, an outstanding type set with many of the choicest offered for some time (most pedigreed to past special collections), and a exciting group of U.S. Patterns. In December of 1978, several months after Harold L. Bareford passed away, the family asked us to offer for sale the first part of Harold’s famous collection, some 242 outstanding specimens, rarely duplicated at public auction. I had known Harold since he came home from Navy duty during World War II. On the first day we met, I learned of his desire to collect coins. He tried to get the best that was available, not necessarily trying to finish a series but rather to have beautiful and rare coins he could keep at home, to study and admire. Harold Bareford was a close friend of the entire Stack Family. His office was close to ours, so on many a weekday, Harold would stop over to Stack’s retail store on 46th Street during his lunch period to visit and chat, asking every time he came in: “You guys got anything in for me to see?” So, of course, we showed him our newest acquisitions, as well as an “early bird” view of a collection we were preparing for sale. He had a wonderful eye for quality. He felt that whatever he acquired would qualify as being “among the best”, and Harold bought whatever he could with that goal in mind. He liked early American Silver and Copper Coins, and many a time would debate with Dr. Sheldon–also a constant visitor to Stack’s–which variety he has that may be a contest to one in Sheldon’s book. Some of the coppers that Harold had were finer or more beautiful than Sheldon remembered, so after much discussion, Sheldon would put Harold’s piece on top of the list! The same kinds of discussions Harold had, mostly during his many visits to Stack’s (he called it his second home), with other specialists in the various series of United States coins. Norman and I loved working with Harold, and his expression as to what he wanted to see in his collection was the finest that might exist, the sharpness and “eye appeal” of each coin he examined being of utmost importance. Both Norman and I learned something new during each of Harold’s visits; it was how we each learned “grading” and “cataloging” from the experts who visited with us. We improved our tutorage from the clients that came in and were willing to teach us. Harold spent much time reading catalogs to determine his desires as to what was “next” on his list. He was always sorry he was away in military service when we had the great Col. E.H.R. Green Collection in inventory. 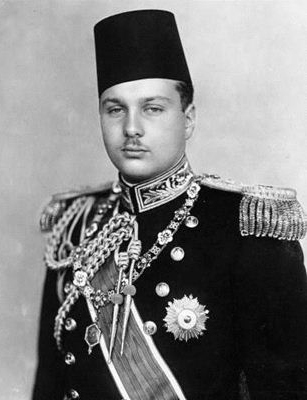 He did, however, buy a few of those coins from the sale of the Farouk Collection. Since Stack’s had two collections to sell in 1954, we did not attend the Farouk sale in Egypt, and Bareford relied on the confirmation of what he wanted after Abe Kosoff re-examined the coins for him and bid them up on his behalf. 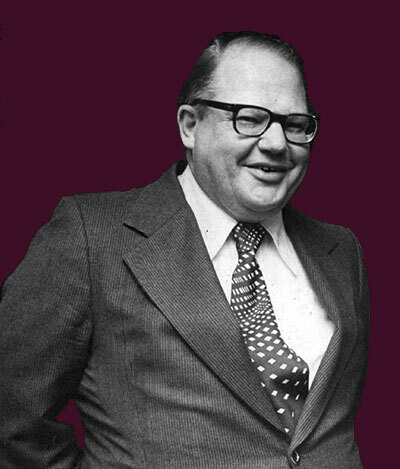 Harold was a great numismatist and was dedicated to the growth of numismatics. 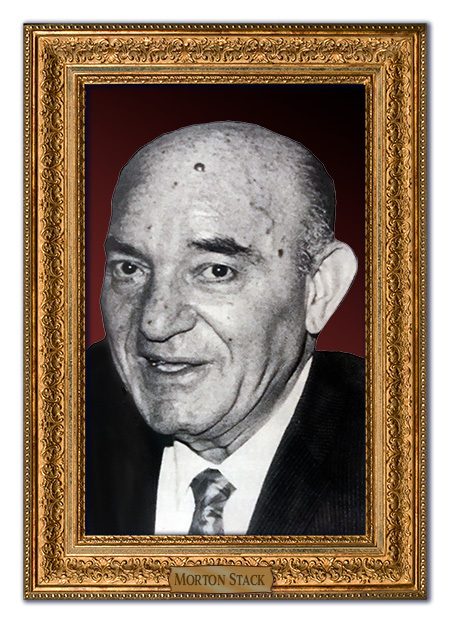 He served on many boards of the local coin clubs in New York and New Jersey and was for many years the President and Toast Master at each of the Greater New York Numismatic Conventions. His legacy will last forever. A few of the Gold coins that were featured in his December 1978 Auction included: $1.00 Gold – 1855 and 1875 Proofs; $2.50 gold – 1836 Gem Unc, l848 CAL, 1875 Bril Proof; $5.00 Gold – 1795 Large Eagle Bril Gem Unc. ex. Farouk, 1823 Gem Unc. ex 1947 ANA auction, l874, 1875 Br. Proof, both ex. Farouk; Eagles – 1862 Bril Proof ex. Davis Graves, 1933 Gem Unc. Mason Williams. The Bareford collection Pedigree is always announced whenever any of his superb coins are offered for sale. 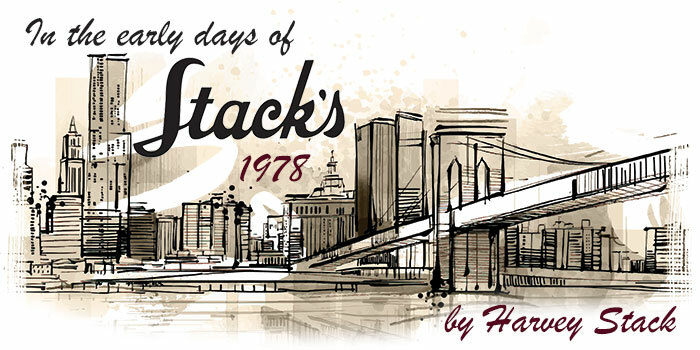 I know, from the family, that Harold favored Stack’s over all other dealers of that period, and left in his will that when his collection is sold Stack’s should be the auctioneer, for which we will always be thankful. For numismatists like myself, who served collectors like Harold Bareford for generations, it is the relationship we were taught to develop by our seniors before us. We had the privilege of knowing these great numismatists, serving them whenever we could, learning from them what they knew and were willing to share, and when they decided to sell their collections they considered all we had done for them and by giving us their collections they were saying “thank you” in their special ways.